An Athlone slimmer who lost three and a half stone has been named ‘Woman of the Year’ in her Athlone Springs Hotel slimming world group because of her inspiring weight loss. 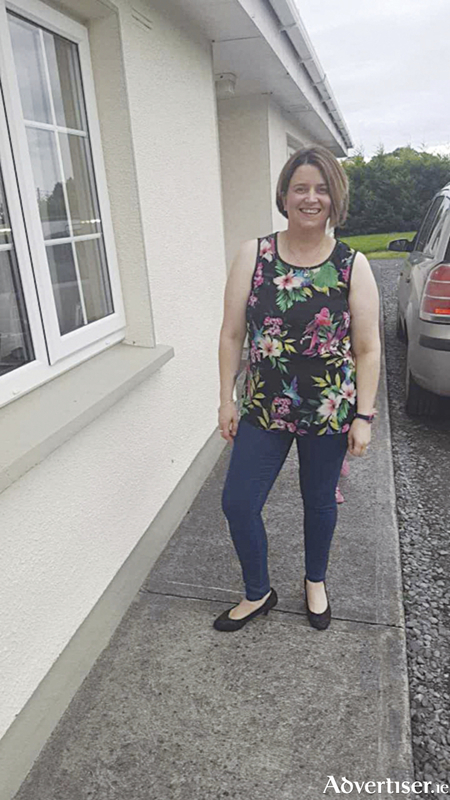 Local woman, Ann Marie Costello from Taughmaconnell is delighted with her weight loss. Many people will know Ann Marie from meeting her in SuperValu Monksland, where she works. Ann Marie joined Slimming World last summer after becoming increasingly unhappy with her size. Speaking about her weight loss, Ann Marie said, “I started to put on weight over the years as I had my children. I tried lots of different diets but they usually left me feeling hungry or miserable – or both, in fact! Ann Marie follows Slimming World’s food optimising eating plan, which encourages slimmers to fill up on satisfying yet healthy everyday foods like fruit and vegetables, lean meat and fish, pasta, potatoes, rice, pulses and more without having to weigh or measure. Continuing, she added, “my family and friends are all amazed by how much I can eat and lose weight. I still eat many of the same meals that I did before I started losing weight, like spaghetti bolognese, curries and roast dinners. Now I just prepare and cook them differently and they taste so much better. I’ve picked up lots of new healthy recipes from the other members at my Slimming World group, too. Pauline, who runs the Athlone Springs group, said of Ann Marie’s weight loss, “I’m so proud of Ann Marie. Not only does she look fabulous, she’s improved her health and is bursting with energy. She’s a huge inspiration to everyone in our group and I hope she inspires other persons in Athlone to change their lives in the same way. It can be hard to admit that you need to do something about your weight and to ask for help, Ann Marie shows just what’s possible when you do though”. The Athlone Spings Hotel Slimming World group is held every Wednesday at 9.30am, 11.30am, 5pm and 7pm. For further information, please contact Pauline on 087 1878701 or check out their facebook page ‘Slimming World Athlone’ for special joining offers. College place – now you’re cooking! Alcohol and Sport – why they don’t mix! Page generated in 0.0690 seconds.